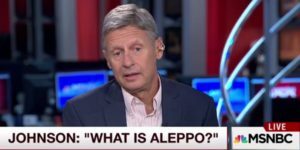 On September 8th of this year, Libertarian candidate Gary Johnson was asked a question regarding Aleppo. The candidate responded “What is Aleppo?” in a nonchalant manner, much to the shock of MSNBC reporter Mike Barnicle. 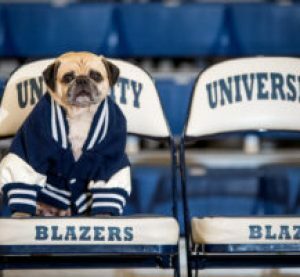 Surprisingly, the backlash of this blunder was met with an ignorance similar to Johnson’s. Many Americans don’t know what Aleppo is, or understand its importance in the current international political landscape. Aleppo is a city in Syria, one of the oldest continuously inhabited cities in the world, with a rich culture and history, and as of 2012, the site of a horrific battle. Aleppo is considered a major front in the Syrian civil war, as it is the primary meeting ground between the US backed rebels, and the Russian backed Assad Regime. The fierce conflict over the city has lasted for four years now, and it has been brutal. Civilian casualties grow day by day, and have led to a group of civilians known as “White Helmets” forming, whose primary job is to help rescue survivors and mitigate damage after airstrikes. These White Helmets are one of the reasons Aleppo has been brought to the world stage, as footage surfaced of the group pulling children from rubble. The conflict has become so intense that the UN Human Rights chief has called out “War crimes of historic proportions” in the city, with estimated civilian casualties reaching as high as 470,000 lives. Obviously this is a monumental death toll, and many of these casualties were collateral damage from airstrikes originating both from the United States and Russia, while other deaths were caused by the Assad Regime, who have been known to intentionally target civilians. These airstrikes have led to many standoffs between US and Russian air forces, further straining the tense relationship between the two global superpowers. Such large scale conflict has allowed the infamous terrorist group ISIS to leak into the Syrian territory as well, leading to large swathes of territory being claimed by the radical group. This has been problematic, as ISIS’s involvement in the region is the main concern of many politicians as opposed to the massive humanitarian crisis, which is yet another reason for the shocking lack of media coverage of this issue. With the conflict in Aleppo raging, and civilian casualties rising, it is imperative something be done to put an end to the violence. This is why Gary Johnson’s statement was more than a small blunder: it was a statement of ignorance and insensitivity. It was a statement saying that we, as the United States, are not aware of the large role we have played in this conflict that has claimed hundreds of thousands of lives.